According to the Department for Transport, cyclists likely to be exceeding 18mph should use roads and avoid cycle paths. That being said, cyclists have as much right to use the road as anyone else and should be treated as such. Drivers are allowed to use the roads by license, not by right. 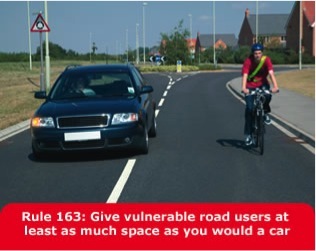 Therefore, cyclists should be given the respect they deserve and in turn they should also respect other road users. Riding two abreast is not illegal by any means, however rule 66 of the Highway Code suggests situations when it may not be acceptable to adopt a position of two abreast, when on narrow or busy roads and when riding around bends. This is a very vague generalisation and we can only gain more specific details when cases concerning the issue are brought before our Court system. A safe assumption would be to use your own common sense and judgment. Cyclists often ride in this way for safety reasons as it forces car drivers to allow the requisite passing distance of at least 1 meter. However, in some situations, cyclists who ride more than two abreast could, in theory, be guilty of causing an obstruction of the highway.